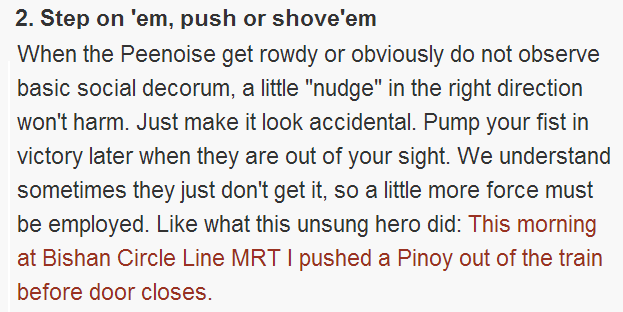 The issue about the racist blog in Singapore provoked a lot of Filipinos. The said owner of the blog was anonymous and there is no identification put in the blog itself. Because of this, the Filipinos are left wandering who wrote the said blog using Blogger platform. For the sake of justice, here is Centertechnews’ reaction on what the blogger has written. 1. Well, Filipinos are one of the best English speaker in Asia and it can adapt to any language easily. Wherever we go around the world, there are Filipinos and they can speak the same language that that particular country is speaking. And speaking about English, there are so many English language schools in the country and other foreigners come here to study. 2. This is an inhuman act! If a person does not do something harm on you, why would you harm him? Filipinos are peace loving people and are hospitable by nature. When foreigners come to the Philippines, Pinoys give the warmest welcome and the best attention to them. 3. Jollibee is a great fast food chain and no matter what you say, the foods are delicious. Doing what the blogger has written on his blog is immaturity and lack of education. Educated people don’t do that and Pinoys don’t do that. Pinoys are educated. 4. We do believe that Singaporeans are well-disciplined. Filipinos have been in the country for so many years and there are Singaporeans as well who married Pinays. I, as a Filipino, has high respect to the Singaporeans and it is horrible when an accident happens involving a Pinoy and not any Singaporean move to do an action. When this thing happens in the Philippines, no matter who the person is, Filipinos are ready to help. 5. Filipinos are religious people. Well, God answers prayers from a humble heart and prayers that are for the betterment of other people. Do not pray for something that can destroy your fellowmen or that will come back to you. 6. 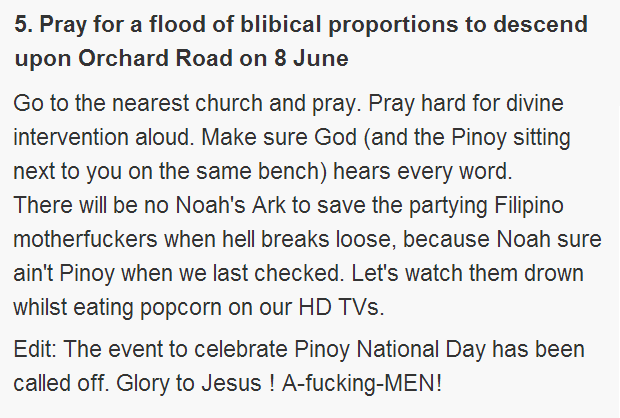 And lastly, Filipinos are not “cockroaches.” They are lions who knows how to fight, so beware. But though this is so, Filipinos choose to be kind towards others. If you would like to report abuse to Google, here are the links, you can report violence in speech and harassment in action.